I get into a lot of different styles and one I have begun to enjoy recently is a clean design with geometric shapes for effect. Di’Cor released this set at the newest round of Cosmopolitan and it gave me an excellent opportunity to play with shapes and have a little fun with creating a design that was “out of the box” for me. 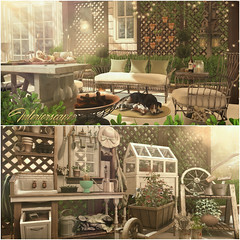 Once again, lots of texture change options from this very generous designer and several pieces are included with this set. Check out Di’Cor on Facebook for new releases and upcoming events! NOTE: The beige pillows are pillows I de-linked from another set to add for accent.